When we are in camping mode for more than a day I wanted to give Willow a way to get in and out of the shell area of the Tacoma at will. 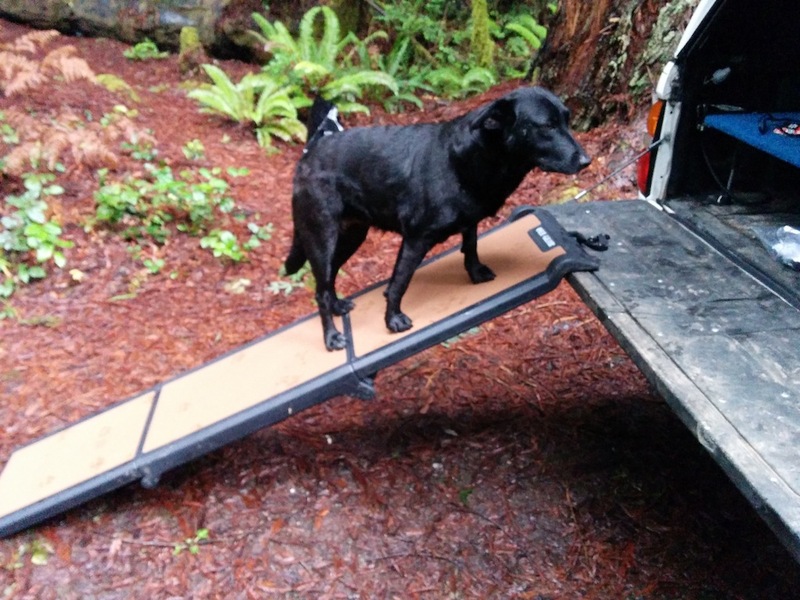 With her somewhat reduced mobility we looked for a solution to give her the freedom and flexibility to live her life on her terms and this ramp seemed like the best of only a few options. Pro tip: the Black and Grey color version of this ramp is almost $100. The Black and Yellow version about $86. Choose this chocolate color for a substantial savings off those prices. We looked at and even tried a few different little doggie stairs. She didn’t like using them because, I believe, the steps were too small and too tall for comfortable climbing. The ones we found were also too flimsy or way too stout for portable use and too bulky for efficient packing when we’re on the move. The ramp gives us the main features we were seeking: usability, portability and packability. I unfolded the three segments and they lay locked together. The tapered end goes on the ground and the curved end over the edge of the open tailgate. There is a short nylon strap with a small carabiner for securing the ramp against falling off the edge. She was using it in 10 minutes. It took only a few patient lessons of gently leading her up the ramp, then praising her adventurous spirit and then back down the ramp follow by more praise and some tactically placed scratches. She can now use the open shell as a raised and padded shade platform upon which to rest and gaze out over the domain she is presently calling her own. The sandpaper-like covering on the top face is a bit abrasive and I can tell she is not enamored with it but, for now, the bonus is it gives her a quick, free nail sanding each time she uses it. I’ve seen mention of some people removing and replacing it with pieces of Berber or sisal carpet attached with spray adhesive. I expect I’ll undertake that little project as soon as the sandpaper covering starts to tear or otherwise degrade but for now it meets our needs. She now can pick and choose between three of her most favorite pursuits: sun bathing until she is too hot to touch, dirt bathing until she looks like someone else’s dog and relaxing in a shady space… preferably padded and looking out over whichever domain she has recently claimed for all dogkind.